I am truly pleased to share with you all today that Breast Carefor Washington has entered into a partnership with Community of Hope at their new facility in Southwest DC. Existing as the sole provider of 3-D mammograms East of the Anacostia River, we plan to begin offering services in May 2014. Below is our joint press release from this morning’s events! WASHINGTON, D.C. (March 17, 2014) – Breast Care for Washington (BCW) announced today that it is partnering with Community of Hope to provide the D.C. community with comprehensive breast care services. The full-service breast center, located on the main floor of the Conway Health and Resource Center, will include mammography screening, diagnostic imaging and patient navigation for women with breast cancer. While aimed at providing care to all D.C. women, the center will focus on women in Wards 7 and 8, where access to services is limited. BCW will bring the first 3D mammography machine East of the River, providing low income women with the most advanced breast cancer screening technology which allows radiologists to detect cancers earlier when they are easiest to treat and reduce unnecessary callbacks and follow-up tests. In addition to offering state-of-the-art mammography screening, BCW will offer ultrasound and minimally invasive biopsy capabilities and plans to open in May 2014. Community of Hope and BCW will work together to ensure patients are knowledgeable of the various services offered throughout the health center. Through the Community of Hope and BCW partnership, both organizations aim to address the health disparities plaguing the Ward 8 community. Access to breast cancer screening and diagnostics is imperative, because, despite having lower incidence rates, black women have a 41 percent higher breast cancer death rate compared to white women due to a number of factors, including inequities in breast cancer screening, follow-up and treatment after diagnosis. Advances such as the 3D mammography screening offered at the center gives radiologists the ability to view inside the breast layer by layer, helping to see the fine details more clearly by minimizing overlapping tissue. While 3D mammograms are beneficial to all women, they are especially helpful in allowing doctors to screen for cancer in those with dense breast tissue. BCW will also employ a patient navigator who will ensure patients obtain the appropriate follow-up care and treatment for breast cancer when necessary. 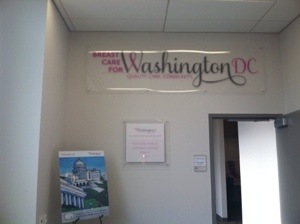 About Breast Care for Washington, D.C. Breast Care for Washington (BCW) is a newly incorporated non-profit community-centered breast cancer screening organization. Founded in 2012, BCW aims to enhance access to breast cancer care and treatment among medically underserved women in the greater Washington, D.C. area. Dr. Regina Hampton, a co-founder and current Board President is the only dedicated breast surgeon in Prince George’s County, MD. BCW’s founders and founding Board of Directors have extensive experience in medical care, building quality health networks, and patient advocacy. Joined by a common goal to make breast cancer screening readily available and accessible, they formed BCW with the mission to reduce breast cancer mortality in the Washington, D.C. area by promoting access to breast cancer screening, diagnostics, and treatment to all women regardless of their ability to pay. For more information on Breast Care for Washington or to donate, visit breastcaredc.org or call (202) 465-7164. Founded in 1980, Community of Hope works to improve the health and quality of life for low-income, homeless, and underserved families and individuals in the District of Columbia by providing healthcare, housing with supportive services, educational opportunities, and spiritual support. In 2013, 354 homeless families received housing with supportive services and 7,100 patients received medical, dental, behavioral health or birthing services. Community of Hope was recognized by the Washington Post for the 2012 Award for Excellence in Nonprofit Management. Next > But you’re too young to have cancer…right?